Never heard of Langfinger? It would have been easily missed at Spiel 09 but it’s one of my favourite games from this year. Players are thieves who collect tools to steal loot (paintings, statues, gold) which they then fence for points. First to 20 points wins. Each player gets three actions per turn and there are five actions to pick from: Get tools (City), Steal loot (Villa), Swap tools (Ruin), Steal loot (Museum), Fence loot to gain points (Harbour). Players must select their three actions for the round first and then the actions get resolved in order. To claim an action, players take turns placing one of their 3 markers on the relevant action location. More than one player can perform the same action but the first to claim an action will go first when it is resolved. This is a critical element as what you want may not be there when it gets to your turn. This is the first interesting game mechanic. Do you take first choice of the tools or do you want to be first to grab loot? You need the right tools to be able to steal the loot, but, if you don’t have first choice of the loot, which tools will you need? What are your opponents going to want to do? These are simple but interesting choices which make for clever game play. Collecting the correct tools to stealing loot is fun and relatively straightforwards (although the other player(s) may beat you to the tools or the loot), but stealing loot is only useful if you can convert it into points using the fences. Each fence only accepts certain types of loot, plus some give bonus points and some accept two loots in one action. This is the second interesting gameplay mechanic. In my games, it has become clear that you need to watch carefullywhich loots can be fenced because stealing loot which can not be converted will not win you the game, especially later on when the next few points could win the game. The game looks really nice and comes in a small box with a small board. Pegasus could easily have made this a physically larger game and charged more accordingly but it’s nice that they didn’t. As a result, it is better for it, making it pleasantly small and giving it a superb price of 15 euros. Overall, Langfinger is a quick, light and smart game. It’s full of choices, looks great and has some cute gameplay. From experience, I can say it plays well with 2 players and (as the game scales up with more players) I see no reason why it won’t play just as well with 5 players. This game is really worth a look. 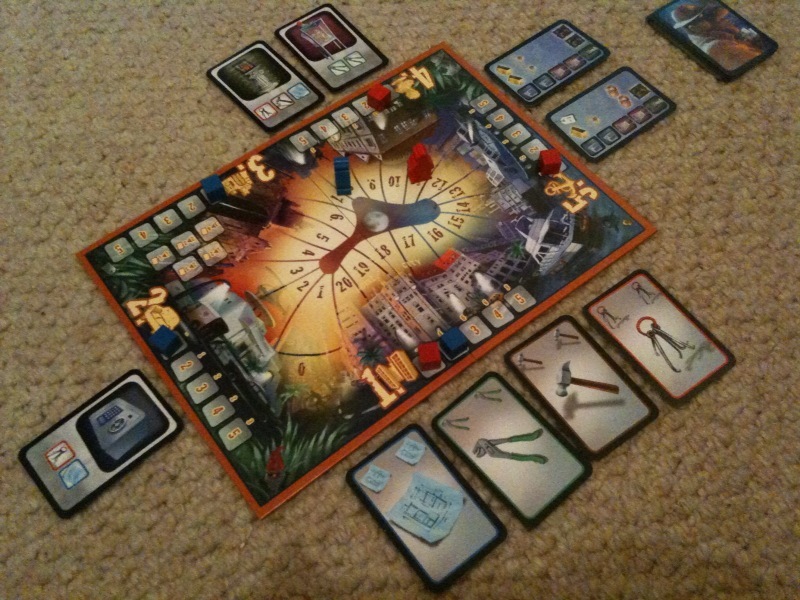 This entry was posted on Sunday, November 1st, 2009 at 12:02 pm	and is filed under Board Game Review, Board Games, Essen Spiel 09, Langfinger. You can follow any responses to this entry through the RSS 2.0 feed. You can leave a response, or trackback from your own site.